Victory at Burnley means Liverpool have made the best start to a league campaign in their entire history – but they had Alisson Becker to thank after surviving a scare at Turf Moor. 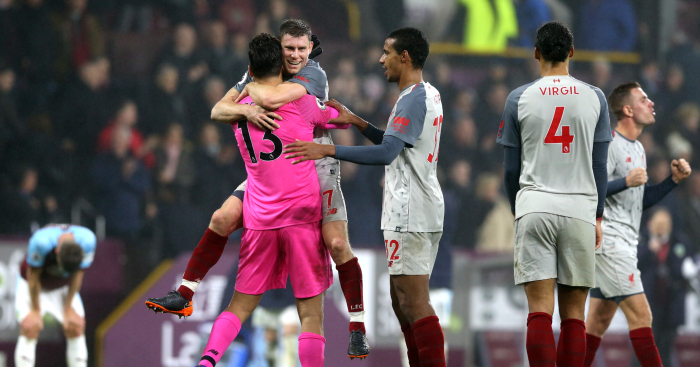 Liverpool won 3-1 against Sean Dyche’s men but found themselves behind in the second half as Jack Cork gave Burnley the lead. James Milner fired home an equaliser from the edge of the box eight minutes later and the Reds took the lead with 20 minutes to play thanks to Roberto Firmino’s goal. However, Burnley pushed for an equaliser of their own and came incredibly close in stoppage time, only to be thwarted by a brilliant save from Alisson. And the Brazil international followed that up by kickstarting a counter-attack which led to Xherdan Shaqiri sealing Liverpool’s win with a third goal. Can you name every member of Liverpool’s 2000-01 squad?